Heather, Errant Thoughts, tagged me for this favorite authors meme. It was a fun one to think about. I’ve always said that Jane Austen is my favorite author … and I have indeed read all of her books numerous times and loved them each time I read them. And each time I reread her books, I understand and appreciate them in a different way, so she’s been a favorite at many different stages of my life. Carolyn Keene, the “author” of the Nancy Drew series, was my first favorite author. 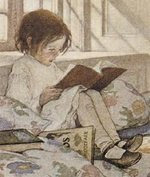 I adored those books, read every one that had been published at that time, and developed a lifelong love of mystery books. She’s definitely a nostalgic favorite even to this day. The Nancy Drew books were ghostwritten by different authors, but the first 23 (the ones I adored) were actually written by a woman named Mildred Benson. Click here to read about her. One of the most recent addition to my list of favorite authors is Gabriel García Márquez. I was completely captured by his writing last summer when I read Love in the Time of Cholera. I know it was partly because of my year spent in South America as an exchange student in high school, and because his descriptions and the beauty of his writing brought back so many memories and feelings from that year of immersion into another culture and language. This entry was posted in Favorite authors, Memes on May 28, 2008 by Robin. This is a fun meme! I think I’m steal it later. Daniel Wallace, Jane Yolen, Gabriel Garcia Marquez…as you know I love them too. And I really need to read some Jane Austen! I’ve been tagged for this too – my answers will be up later. OMG! Patricia McKillip! How on earth could I forget her on my list of faves?! I just KNEW there was someone I was missing. I had no idea the Nancy Drew books were written by a bunch of different authors, although of course in retrospect it makes perfect sense! Jane Austen is a perennial favorite of mine, too. Nymeth, I enjoyed your response to this meme, too. You, of course, introduced me to Daniel Wallace — (I’m reading The Watermelon Man right now and loving it.) And it was your review of Love in the Time of Cholera that made me want to read it immediately. I wonder how you would like Jane Austen? When I read her now, I have to shift gears and let myself glide into her world. It’s different, but I still love that world. Tara, I’ve been out of town, but I’ll look at your blog and see if you’ve posted your version of this meme. Heather, this was a fun meme to do. I’ve really only read one Patricia McKillip, but have a couple more lined up to read. I loved her writing in the book I read. Bookfool, I’ve had One Hundred Years of Solitude on my list forever, and on a couple of challenge lists for myself. I finally decided to wait until my summer break to start it, though. I want to have the time to read it without having to be interrupted by work. Bellezza, I read Love… last summer and loved it, but responses to it are either hot or cold … nobody seems to be lukewarm about it.